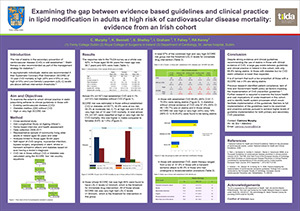 TILDA researcher Dr. Catriona Murphy was awarded a prize for best poster at the EuroPRevent 2014 conference in Amsterdam. The conference theme was Global Cardiovascular Health and the research presented used TILDA interview and health assessment data to examine the gap between evidence-based guidelines and clinical practice in lipid modification in adults at high risk of cardiovascular disease mortality. The research concluded that despite strong evidence and clinical guidelines supporting the use of statins in those with clinical evidence of cardiovascular disease, a large gap exists between guidelines and clinical practice in Ireland in the cohort examined. Previous research has demonstrated poor control of risk factors in those with established coronary heart disease. Failure to adhere to prescribed medications may explain some of the difference identified between guidelines and practice. It is also of concern that a low proportion of those who were asymptomatic but at high risk using SCORE were taking statins. This suggests that routine global risk assessment is being underused in clinical practice. Barriers to full implementation of the guidelines need to be examined in light of these findings and proactive policies pursued to achieve higher levels of guideline implementation.